All signs in the small city of Thanjavur lead to the "Big Temple," the complex Brihadeeswara dedicated to Shiva. On day three we woke up early to visit its immense courtyard before the crowds had assembled. The mandir is a beautiful, golden example of Chola architecture dating back some 1,000 years. It has that dramatic pyramidic shape characteristic of Tamilian temples but without the splash of colors. Viewed during sunrise, it's a wonderful wash of oranges and yellows. We had the place mostly to ourselves the whole hour we were there. Except, of course, for the five minutes Matt spent shaking hands and taking photos as his alter ego - Mostly-White-Man-Resembling-Rahul-Gandhi - when he was spotted by a traveling group of young Indian men. Then we packed our gear and hit the road. So far on our rides we'd been hugging the blissfully pristine East Coast Road, enjoying speeds up to 65km/h and few obstacles save some local two wheelers. I don't think I need to tell you how unique our road experience had been. 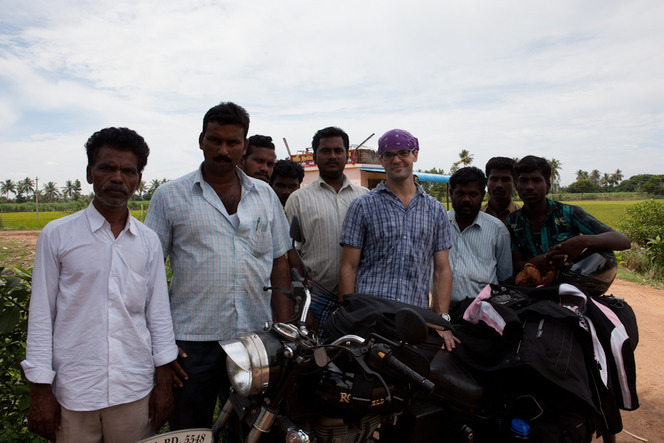 Riding in India is not like in the states, or like anywhere else for that matter. There's the, uhm, unpredictability factor. There's less infrastructure, fewer regulations.... Still, Matt and I started our road trip thinking, "Eh, let's do only a little planning and see how it goes." It went until day three. We had decided to follow the plethora of advertisements proclaiming "Filtered Kumbakonam Coffee" to Kumbakonam itself, where we expected to find coffee plantations and good coffee and stuff. Did we confirm the ads were true? We planned to, when we got there. The road to Kumbakonam was about 1 1/2 compact cars wide and had a surface like the moon. From the start it was swollen with local buses traveling in both directions and passing each other around crumbling bends. They'd stop suddenly in front of what looked like... nothing. Ten people would get off, all hurrying this way and that towards... a house, a town? It was hard to tell. It was also difficult to discern when the driver would start up again. But just as suddenly as he stopped he would turn the wheels at a 45 degree angle into the road and blast off, taking up more than his 1 1/2 cars width worth. This made passing almost impossible. This was to say nothing of the lorries, which would barrel ahead and cover us with a thick, black fog. This was followed by being pelted down the road with flyaway cargo. Large groups of school children were also invariably around the next bend. At the first opportunity they would run out and hop onto the buses - traffic beware! We felt we had been unceremoniously dumped into the deep end of Indian road driving after having only dipped our toes in a bathtub. An hour into our ride we were feeling our naiveté. We'd also developed a newfound love for our fellow two wheeler riders and were cursing the sight of buses and lorries. There were moments, even on this road, where we relished the experience. At one point we rode alongside a small school bus full of children in their 5th standard (11-12 years old) at a Tamil-medium school (taught in Tamil). They called out questions to us as our vehicles inched forward behind a line of lorries: "Which country?" "How many years?" "Marriage?" They pronounced each syllable precisely, as though confirming that these strange sounds formed a real language; this English business wasn't just a joke. In unison, they shouted out "Thank you!" and "Goodbye!" as their bus turned off our road. We made it to Kumbakonam and our un-plan unraveled. From our vantage, the place looked like every other small Tamilian city. Here and there a mandir sprouted above an endless growth of small storefronts. We stopped in the middle of town by the side of the road. And there we were, dirty, tired, and clueless, attempting to avoid being broadsided by all the passing lorries and wondering what to do with ourselves. People talk about their travels in India as though the country itself is an eccentric mentor, pushing them to the extreme to teach them something. We've heard quite a few stories of travels that conclude with "I didn't know what I was looking for, but India did!" We don't think of India as a wise old uncle, but certainly as a country of extremes. And we're familiar with pushing ourselves to extremes in pursuit of a goal. In our experience, this results in one of two things: we bend, or we break. Bending, adapting, looking at things from a new perspective; these are the teachings of travel. We had a telephone number - a lifeline - connecting us to a local rider in Chennai. Ganesh, we reasoned, probably had experience to prevent himself from winding up unhappily on the side of a road in noontime heat. Matt called. I shuffled around and tried not to sweat. I heard him explain our situation, how we'd headed west off the East Coast Road and were planning on doubling back later toward the coast. Then there was silence. On the other side, Ganesh was saying, "Oh, no, no, no, that's a terrible idea. You can't do that." To riders, routes should look like well-planned geometric shapes. Not zig zags and meanderings and such. They should take in a sampling of what's on offer and, if at all possible, over enjoyable roads. He said he'd help us form a new route with the help of a group of some dedicated local riders called HVKFans. We balked a bit. See, we plan to be unplanned. We're zealots. To a fault, at times, but also to keep things fresh. Canned travel makes us squirm, especially when it includes an agenda tailored to foreigners. Ganesh was quick to point out, "You're not in America." He suggested, gently, that in India hotels had to be booked and plans made in advance. Even he rode this way. We started to see our loose sketch as folly. We could explore, sure, but on these roads, seeing anything was no sure bet unless you picked the right route. Welcome to Indian riding, ya foreign idiot. We started off with something palatable and manageable, a single destination. We confirmed with Ganesh a few times verbally, checked our maps for Thiruvaiyaru, heeded his road suggestion and took off, heading west. As we were riding, Ganesh sent us a text with the information, reconfirming his offer to help. I read it aloud to Matt as he rode. Things were coming together. After an hour or so of much smoother road, we came upon a long line of those dreaded lorries, all parked at the side. The lorries were so appealingly decorated and painted, we stopped to take a few photos. The drivers all seemed to be waiting for something, either lounging in their cabs or gathered in groups under the shade of a few trees. While I took photos of the rainbow of colors, a group of eight formed around Matt. I traveled up the line of lorries, waving and photographing. Then I went back to check on Matt, who was listing all the towns we planned to travel to in order. The drivers were shouting them back in agreement, wagging their heads. I assumed this meant that introductions were over: where we were from, number of kids, distance traveling, where we got the bike, how much it cost etc. The second time I came back they were all admiring our gear. The drivers were especially enthused by the kneepads, which they'd never seen before. Matt knocked on the plastic of his pads saying, "Safety." Head wagging all around. "Yes. Yes. Safety first." When I came back the third time Matt had a carrot in his mouth and he offered me one. "Ooty vegetable?" he said, repeating something we'd heard about all root vegetables being grown in the Nilgiri hill station of Ooty. "Ooty vegetable," the driver wagged his head. The drivers, 100 lorries in total, were all waiting for either lunch or the construction project they were working on, we couldn't quite tell. They were friendly in a disarming way, in a way that melted all our frustration about them overpassing us on the road. We spent an hour or so with them, hand-signing and passing pieces of English back and forth. And carrots. Most of which one driver eagerly stuffed into our satchel for later. Then we waved and parted ways. Our ride to Thiruvaiyaru continued, and the road turned commercial again. When we finally arrived we were itching to get off the bike. We took a spin around the town surprisingly quickly, remembering that Ganesh had told us we'd find plenty of hotel options. If we could find a hotel in a place this small we were ecstatic. But the way people noticed our bike suggested there were no hotels accepting foreigners to speak of. Schoolgirls walking arm in arm down the main road eyed us cautiously. We did another pass, searching the streets for hotels, despite seeing not a single sign with roman letters. Nada. Zilch. Zippo. We were dumbfounded. We passed onto a deserted residential road, clean and cement-lined, and pulled over. We called Ganesh. No answer. A pickup passed by, blaring music through two huge speakers, promoting the clothing company RamRaj. Matt jammed his fingers in his ears. It was hot. We were exhausted. We concluded we had the wrong town. Out came the map. We scoured it, looking for something with a bit larger text print than the tiny Thiruvaiyaru and its tiny dot. There was one, Thiruvarur, hours to the east. Matt had confirmed prior with Ganesh that it was Thiruvaiyaru, not Thiruvarur. A sinking feeling came on. We remembered the text and pulled it up. There it was: Thiruvarur, our second sign to make a plan. A plan that was foolproof against our obviously terrible Tamil pronunciation. The truck was already making its second round through the clearly minuscule residential area. When he spotted us this time, he turned the music way down as he passed. He wagged and smiled at us, the only people visible to witness his ad. We wagged back and resolved to ride on. It was still only just passed lunch. We'd eaten nothing since before 6am. I'll spare you the suspense. We did make it to Thiruvarur. We did find a hotel. We did check in. We did get food. And how our route unfolded over the next few days, from our experience, does only happen in India. It wasn't India that showed us the way, necessarily, but many different people who gave us guidance, encouragement, and took us under their wing. That's the Indian way.